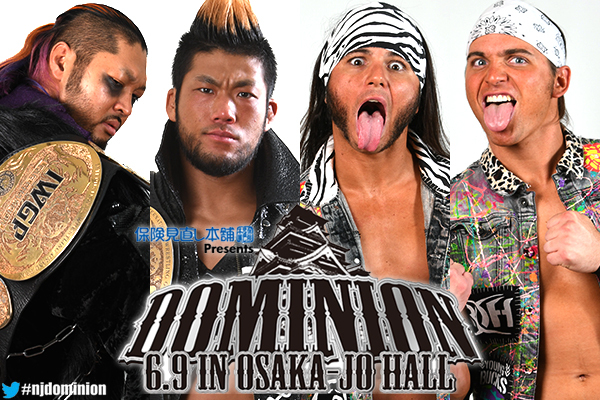 Huge matches announced for Dominion June 9! Omega Okada IV! 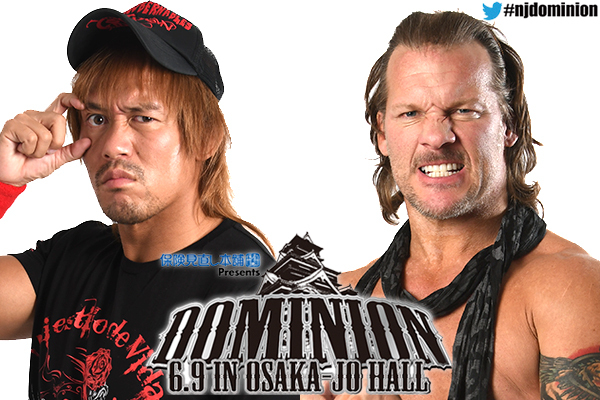 Naito and Jericho! Rey Mysterio Junior in action! At Wrestling Dontaku on May 4, the Rainmaker became the history maker as Kazuchika Okada defeated Hiroshi Tanahashi to extend his IWGP title reign to a record 12 defenses. A hard fought match between legendary rivals, Okada ultimately vanquished Tanahashi with the Rainmaker. 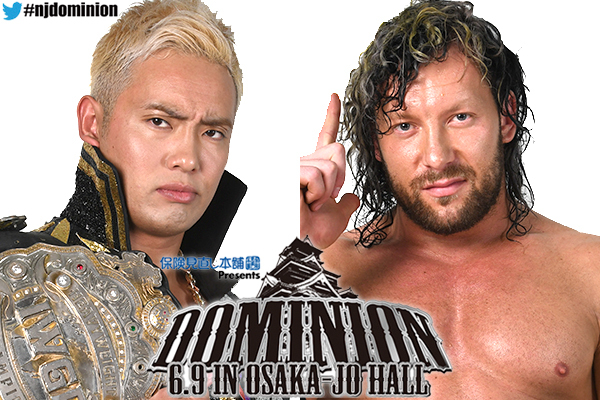 In the main event of Dominion in Osaka Jo Hall, he will look to make it V13, after nominating Kenny Omega. If you can apply an asterisk to any of Okada’s 12 defenses, it’s Omega at Dominion 2017. On that night, Okada didn’t defeat Omega, but rather a 60 minute time limit draw meant the belt stayed with the champion. That one asterisk irritated Okada enough that a year after the match that entranced the world, the champion wants to right that perceived wrong. ‘It can’t end on a draw,’ Okada would say to Kenny in Fukuoka, ‘Let’s make sure a draw can’t happen. No time limit!’ Yet Kenny said he could go one better, and proposed a Two out of Three Falls Match. While Two out of Three Falls Matches have happened before in NJPW, this has never occurred with no time limits in place. One can only imagine the physical limits both of these warriors will push themselves to. Right now, the Okada vs Omega scoreline is at 1-1-1. This will be the ultimate rubber match between arguably the best foreign wrestler in New Japan history, and arguably its best champion of all time. On April 29, Tetsuya Naito defeated Minoru Suzuki for the IWGP Intercontinental Championship. At Dominion he has his first defence: against none other than Chris Jericho. At Wrestle Kingdom 12 on January 4, Jericho faced Kenny Omega, and while Omega bested wrestling’s self proclaimed alpha, it was a hard fought match that showed Jericho was still at the top of his game. One night later in Korakuen Hall, Jericho viciously assaulted Naito, but with Jericho then returning to America, and Naito remaining silent on the topic, it seemed this issue would remain unresolved. Then, after Los Ingobernables’ tag match against Suzuki Gun on May 4, a masked man in an LIJ hoodie attacked Naito. That man was Jericho, ‘El Alfa’ bloodying El Ingobernable before going on a profanity strewn rampage backstage. Naito wore a crimson mask after the attack, but remained tranquilo. He’d say that ‘I don’t really know who he is, but he’s a pretty big deal, huh? But this is my home. Don’t think you can come here and get out unscathed’. This is the ultimate battle of two kings of charisma. Will Naito continue to reign? Or will the white of his Intercontinental title be stained red by his blood? IWGP Tag Team Champions EVIL and SANADA claimed the titles back at Wrestle Kingdom, and on April 29 retained the belts by vanquishing rivals KES. That’s a tall task for any tag team, but perhaps an even more demanding challenge faces them in the form of the Young Bucks. Now officially heavyweight, the self proclaimed ‘best tag team in the world’ have once challenged the IWGP Tag Champions in the past; in 2016 while still junior heavyweights, they faced the Briscoe Brothers. That time, the Bucks were unsuccessful, but now, with more experience, more weight and even more ability, they may be impossible to deny. 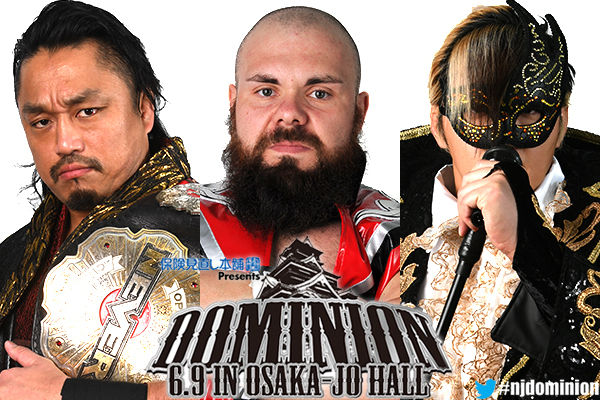 Hirooki Goto will face the fourth challenge of his NEVER Openweight Championship at Dominion, facing not one, but two challengers: Taichi and Michael Elgin in a three way match. In Hiroshima on April 27, Goto bested a game Juice Robinson in a hard fought battle. Afterward, Elgin named himself Goto’s next challenger, which drew Taichi’s ire with a ‘you don’t get to do that so easily, baldy!’. Taichi would end up attacking Goto with his microphone stand. After attacking Goto again on May 4 on the entrance ramp, Elgin intervened and the three stood off. Goto would say afterwards ‘screw it, I’ll take on both of you at once!’ That proclamation set up the first three way match in NEVER Openweight history. Will it be Goto’s samurai spirit? Elgin’s awesome power? Or Taichi’s dastardly tactics? 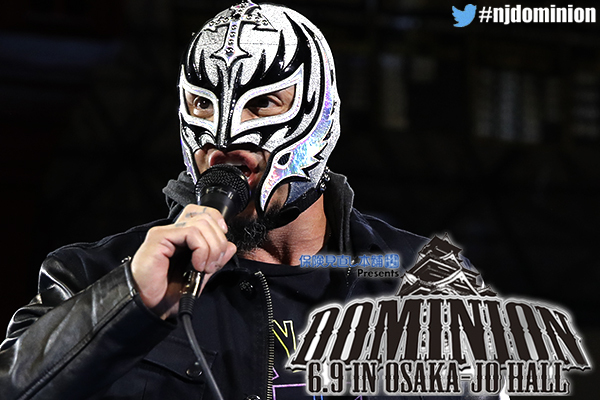 One more huge addition to Dominion is Rey Mysterio Junior, as the 619 comes to Japan on 6/9! On March 25 at Strong Style Evolved, Mysterio was scheduled to face Jyushin Thunder Liger. After a bicep injury put Mysterio out of action, Liger faced IWGP Junior Heavyweight Champion Will Ospreay instead. With Mysterio at ringside, Ospreay won the match, and subsequently challenged the junior heavyweight legend. Before Rey could accept, Marty Scurll would interfere, attack both men and swipe Mysterio’s mask. The melee ended with Mysterio shaking Liger’s hand and embracing Ospreay. Now finally ready for action in an NJPW ring, just who will this living legend face?